If you get injured and can’t take the full PT test, you actually have to meet a smaller waist measurement than healthy airmen. Read how it’s harder for injured airmen to pass the tape test than it is for airmen who can complete the situp, pushup and 1.5-mile run portions of the test. In other hot topics: Chief Master Sergeant of the Air Force James Cody says the money being used to bring tuition assistance back could have been used to keep two squadrons flying. Tuition assistance was restored on April 10, but the Air Force is still trying to figure out how to fund the program for the rest of the fiscal year. This week’s edition also has a tribute to Capt. James Steel, who was killed on April 3 when his F-16 crashed in Afghanistan. His mother recalls how Steel always wanted to be an F-16 pilot like his father, retired Maj. Gen. Robert Steel. In money news: The Air Force wants to upgrade all of its F-15s and F-16s to keep them flying until the F-35 Joint Strike Fighter is operational and new weapon systems are installed. But the Air Force’s proposed budget for the next fiscal year does not reflect the massive cuts to defense spending known as sequestration that may last for 10 years if Congress cannot reach an agreement on taxes and spending. Budget cuts for this fiscal year have prompted the Air Force to ask airmen for suggestions on how the service can save money that can be used to for more flying hours, base repairs and tuition assistance, said Gen. Larry Spencer, vice chief of staff. 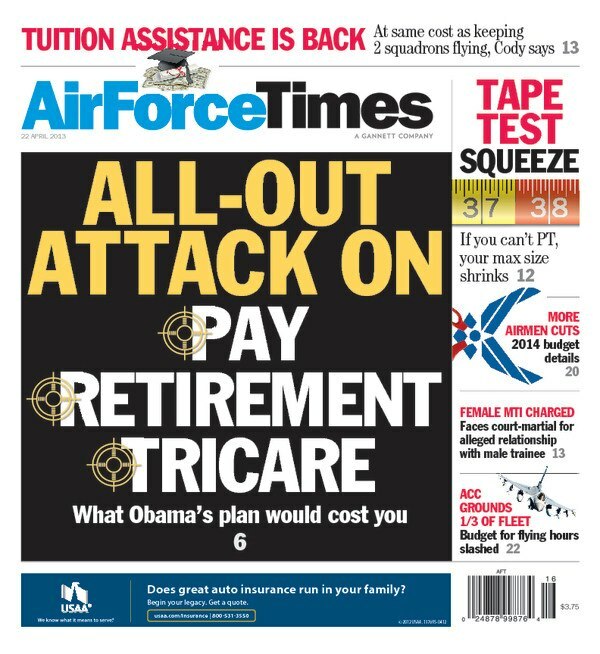 You also can read some of the suggestions submitted by Air Force Times readers about how the Air Force can cut waste. one way is to have a logical plan and use our time effectively to save money manpower wise. With the new motivational P.T. have almost forgotten about mission; work hours prior was 7-4 or 7-5. Now we arent conducting business unitl 8:30 or 9(poor customer service). Get your manpower work time from work, not PT. We should also reduce the amount of Exercises we have worldwide. We are creating our own problems when we attend or host a exercise that will not fully benifit our war mission. Another way we can save money is stop buying software or equipment that has not been fully developed or will not fit our need/functional when purchased. So much equipment is bought, but because its a good deal and contract promises to proved “24 tech support” then the Air Force purchases it. Another savings is we are making basic trainees shoot the M-16 for qualification at BMT, than when they get their first base they show up deliequent because in system like ACES PR because the M-4 is required. Lastly, members who are deployed have to get on contracted plane just to go back to the U.S just to go back to there overseas home station, when in some case they are closer to there region then the U.S. Members are flying over 10k miles when there home station is 5k away. Why is that? I know a few reason, but its not smart business.